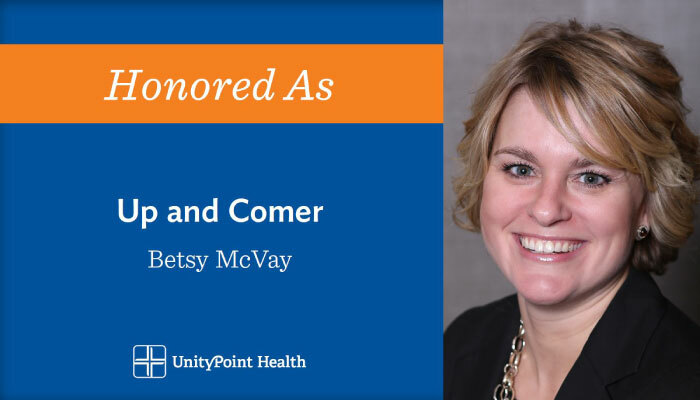 UnityPoint Health Vice President and Chief Analytics Officer, Betsy McVay, is among Modern Healthcare’s 2017 class of Up and Comers. Modern Healthcare, the touted leader in health care business news, research and data, annually honors emerging leaders all age 40 or under, who have made significant contributions in the areas of health care administration, management or policy early in their careers. McVay’s passion for health care started with her desire to utilize her strength of working with math and numbers in a field where she could help people and improve access to care. McVay leads a team of 70, and her work touches every part of UnityPoint Health, from patient experience to human resources. McVay’s team is wrapping its hands around mastering the use of both descriptive and advanced analytics, which has helped position UnityPoint Health in its effort to become a top-decile performer in key performance measures. This year’s 15 honorees are profiled in the October 16 issue of Modern Healthcare and online. Nominations for the program, now in its 29th year, opened in early June and closed in mid-August. The number of submissions more than doubled from the previous year.